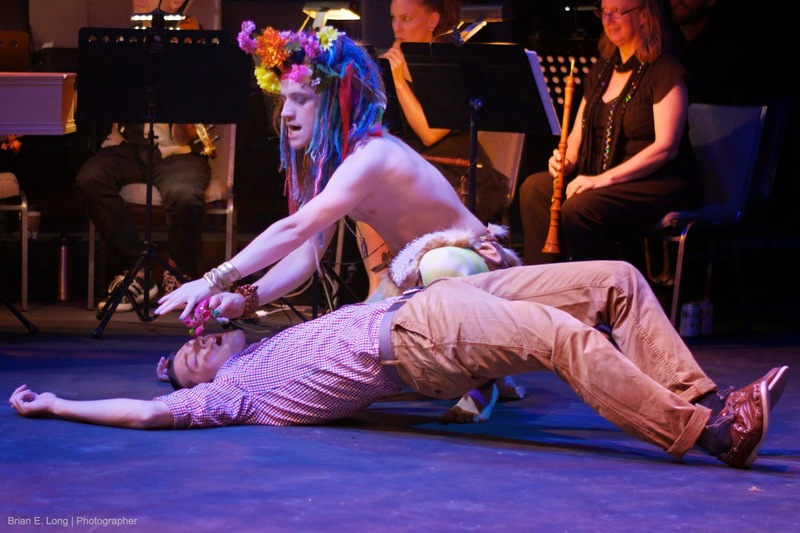 The score of Henry Purcell's 1692 masque opera The Fairy Queen was lost upon his death and rediscovered a bit over a century ago. This obsolete theatrical medium has been made relevant by Dell'Arte Opera Ensemble; they made good use of the directorial and choreographic artistry of the esteemed Christopher Caines. One might say that Purcell's work was "more honor'd in the breach than the observance", to quote the Bard himself. So, five hours was trimmed down to three, some original text restored and some contemporary references added as a framing device. The melodic Baroque music was preserved and various types of dance included. It must have been a challenge to find performers who could sing and dance as well. All the voices were fine but we were most impressed with sopranos Noelle McMurtry (whom we reviewed before) and Tamra Paselk (who was new to us). They captured the Baroque style with pure tones that floated beautifully in the upper register. We were familiar with baritone John Callison (also reviewed previously) and were impressed by how his voice has grown in depth. It was always firmly structured and his phrasing was lovely. Bass Andy Berry impressed with his secure sound. Tenor Leslie Tay exhibited fine dynamic control. Countertenor Brennan Hall was hilarious in drag in a duet with Mr. Callison in which he portrayed a maiden unwilling to be kissed. The marvelous music was provided by The Sebastians, a well-known Baroque ensemble we have often heard at Salon Sanctuary concerts. Co-director Jeff Grossman conducted his able musicians from the harpsichord and one could not ask for anything more. Notable were lutenist/theorbist Charles Weaver and cellist Ezra Seltzer. The performer who virtually stole the show was Drew Paramore in the role of Puck, dba Robin Goodfellow. We cannot sufficiently praise his wonderful dramatic skills and high energy performance. Another high note of the evening were several pas de deux performed by Aynsley Inglis and Luke Tucker. Classical ballet would not evolve from Baroque dance for another two centuries after Purcell's time but who cares! We welcome any opportunity to see a beautiful couple using the vocabulary of classical ballet in such a fine fashion. The effective framing device established by Mr. Caines is that a nanny named Carmen (Elisa Toro Franky) is walking in Central Park and her charge Ariel (Gabriel Griselj) is kidnapped by the fairies. Not to worry, he gets returned at the end. The fairies of Central Park just love to tease and pinch and tickle unsuspecting humans and, in this case, had a fine time with a pot-smoking slacker. The scenes from Shakespeare were well directed and acted but the spoken dialogue lacked the poetry one would hope for. Imani Jade Powers portrayed Titania and also Hippolyta. Jason Duverneau enacted Oberon and also Theseus. Seth Shirley was Lysander and Zach Libresco was Demetrius. The scenes of their rivalry were particularly funny. Cassandra Stokes Wylie made a fine Helena but, as Hermia, Amanda Goble spoke without poetry in an unpleasant high-pitched voice. Nonetheless, her very physical acting served her well. A scene from Oscar Wilde's The Importance of Being Earnest revealed just how fine their acting skills were without the challenge of speaking the Bard's poetry. As Nick Bottom, Andrew Gelles excelled. The "mechanicals" were transmogrified into an acting troupe and Nick Bottom wanted to assume ALL the parts. His transformation into a donkey was achieved with a large construction that permitted his words to be heard. If Titania's affection for the donkey did not make you laugh, then nothing would. Costuming by Nina Bova was exceptional. The fanciful fairies bore feathers, fruit and fur. The two couples with their mating problems were meant to be Dalton graduates on their way to Ivy League universities. They were identified by Puck by means of the Brooks Brothers labels in their clothing. The program notes, written by Mr. Caines, contained a fine description of the origins of masque opera and the history of the period from whence it arose. It was clear from the performance that he labored long and hard to apply his artistry and to make the work relevant. He absolutely succeeded!